for Paul Carter. Paul died a year ago today. The above are static images of the installation. for Paul Carter. Paul died a year ago today. The above are static images of the installation. iTunes‘ clean/explicit labelling worries me. Shouldn’t I, at the age of Dennis the Communist Peasant, be able to decide what’s good for me? Not merely that, but it takes up a bunch of the song title entry, and they label songs by artists who don’t produce bowdlerised versions. Gah! We went to a house concert last night to hear Chris Coole & Erynn Marshall play some Kentucky duets. Erynn’s back from BC to record with Chris; today’s a long day in the studio. Author scrussPosted on 02006-11-06 Categories choonsTags ack, art, artist, banjo, bc, eat, excel, ice, kent, long, money, music, ren, ughLeave a comment on house concert! Ole! Tarantula is in the house, but where’s the promised bonus CD? Paul Carter died in a car crash yesterday near Edinburgh. We were inseparable as kids. He was an inspired artist, even when I knew him. I’ll never forget him asking of his ZX Spectrum: How do I get more colours from this? 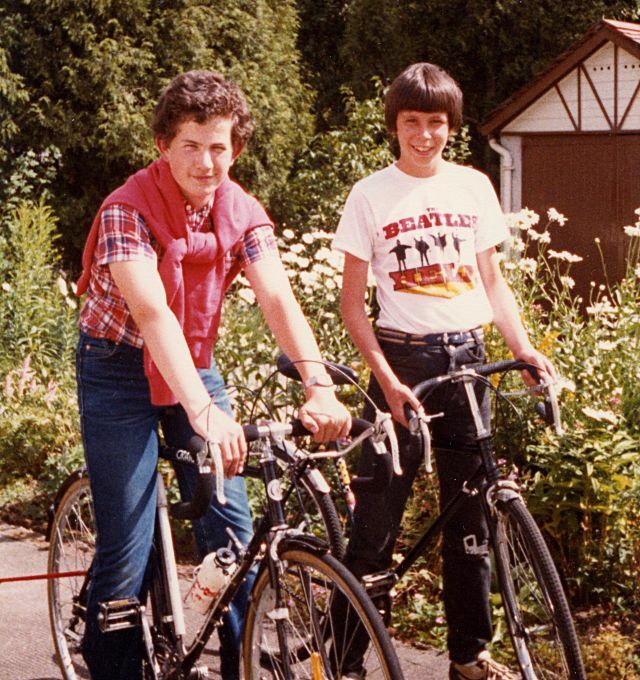 This is me and Paul (right) in the summer of 1983. Paul was wearing his Beatles t-shirt, as usual; I think he’d just painted his bedroom wall with scenes from Yellow Submarine. We were just about to set out on a sponsored cycle. We belted round the track at Crookfur Park until everyone else had gone home, leaving one poor hapless lap-counting volunteer waiting in the dusk. Scottish Arts Council Archive: Paul Carter. Axis Open Frequency: Paul Carter. Update, 21 Aug: Paul’s funeral is this Friday in Joppa at St Philip’s Church, Joppa Road at 10.30 am. There is a wake in the church hall after until 1pm. Thanks to Chris Hill and John Beagles for finding this. I was about to rush off and tell Emma Jane about RE Imaginations – Renewable Energy Art, when I discovered she exhibits on it already.